Mr. Hensel was admitted to practice law before the New Jersey state courts and the U.S. Federal District Court in 1981. 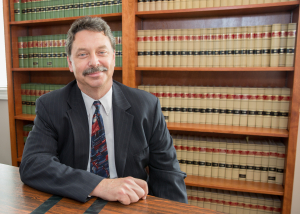 With his 30 years of local legal experience, he has engaged in a diverse general practice caseload including general & personal injury litigation, workers’ compensation matters, criminal & municipal court litigation, real estate closings & litigation, wills & estate planning, and zoning & planning matters, representing both applicants and boards. In 1996 the Superior Court appointed Mr. Hensel as Custodial Receiver for the Berkeley Water Company, a local privately-held public utility in Berkeley Township, which he managed until its asset sale in 2005. Mr. Hensel, born in Toms River and raised in Bayville, New Jersey. He began his legal career as a law clerk for Carluccio and Liston while attending Seton Hall Law School. As an Associate Editor of the Seton Hall Law Review, he published many articles and was subsequently cited in many court cases. Upon completion of law school, Mr. Hensel worked for ten years first as an associate and then as a partner with Carluccio & Liston and then its successor firm, Liston, Hensel & Pinizzotto. During that time, from 1988 through 1990, he was personally designated by the Ocean County Public Defender’s Office as a pool attorney. He also served as Berkeley Township Public Defender from 1987 through 1992. At various times his firm represented both the Berkeley Township and Stafford Township Planning Boards, and were named as Municipal Prosecutors in Pemberton Township and Little Egg Harbor Township, for which he assumed primary responsibility. Mr. Hensel was a member of the Ocean County District IIIA District Ethics Committee from 1989 to 1992. He was elected to and served as a member of the Toms River Regional Schools Board of Education from 1990 to 1993. Mr. Hensel has been in the general practice of law since 1981. In addition to litigation, he specializes in land use matters, representing land-use boards and applicants for zoning and planning approval. He was appointed as a Public Defender for the Lakewood Township Municipal Court and the Manchester Township Municipal Court. He also served as attorney for the Manchester Township Zoning Board of Adjustment. In 2009 he merged with Steven Secare in a practice that specializes in litigation and representing local governments. Juris Doctor, Seton Hall University School of Law, Newark, New Jersey 1981. Member (1979-80) and Associate Editor (1980-81) of Seton Hall Law Review. Bachelor of Arts – Seton Hall University, South Orange, New Jersey 1978. Member, Ocean County District IlIA Ethics Committee, 1989-1992. Member, Board of Education, Toms River Regional Schools, 1990-1993. Named as Citizen of the Year, 1989-1990.